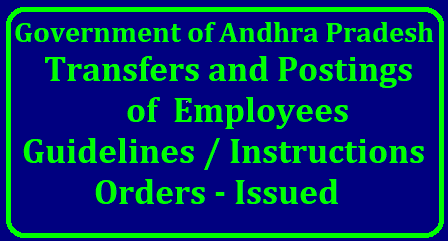 Public Services — Human Resources — Transfers and Postings of Employees — Guidelines / Instructions — Orders — Issued. The Government is committed to the welfare of its employees and seeks to promote work-life balance to enable the employees and their families lead happy and contented lives. In this direction, the Governments policy is to ensure every employee is posted at a work place where she/he is most productive and contributes his / her best for improved governance and efficient public services. Overall, the Government is committed to right placement of the staff to improve efficiency and accountability in administration. Accordingly, the existing ban on transfer of employees imposed vide reference 5th cited is relaxed for the period from 5th May, 2018 to 4th June, 2018 to ensure right placement of employees to secure optimum productivity and commitment to furtherance of Governments development objectives. Employees seeking transfer on these grounds shall have completed three years of continuous service in all cadres at the present station. Station means place (City, Town, Village) of actual working for the purpose of transfers and not office or institution. While considering the request transfers based on above conditions, preference shall be given to the employee with the longest tenure at a particular duty station, seniority in the cadre and outstanding performance record. In case of mutual transfers, both the employees seeking transfer on mutual grounds shall have completed three (3) years of service at their present respective stations. a0 The relaxation on transfers shall be effective from 5th May, 2018 to 4th June, 2018.
i)The department must undertake the transfer exercise in a transparent process using IT application. iii)The vacancies and the preferences of employees shall be exhibited at a prominent place in the premises of the office as well as in Departmental web site. d. The Head of the Department concerned is responsible for the implementation of the transfer orders in the most transparent manner possible without giving any scope for complaints / allegations. Any violation of these guidelines will be viewed seriously by the Government. These guidelines are applicable to all the departments including the revenue earning departments viz. i) Commercial Taxes; ii) Prohibition & Excise; iii) Stamps & Registration; iv) Transport, Medical & Health, Agriculture and Non-teaching staff of Educational Institutions of Education & Welfare Departments. These guidelines are not applicable to teaching staff of Education & Welfare Departments (School Education, Higher (Intermediate & collegiate) Education, Technical Education and Residential institutions etc.). The requests of the employees having any charges /ACB/Vigilance cases pending against him / her shall not be considered for transfer. The authority shall indicate this fact clearly against the name of that employee if there is any request for transfer. No TA / DA will be paid to the employees as these transfers are effected at their request. The ban on transfers shall come into force with effect from 5th JUNE, 2018.